Rent Concrete Loft | Corporate Events | Wedding Locations, Event Spaces and Party Venues. The best view in Los Angeles just got bigger! 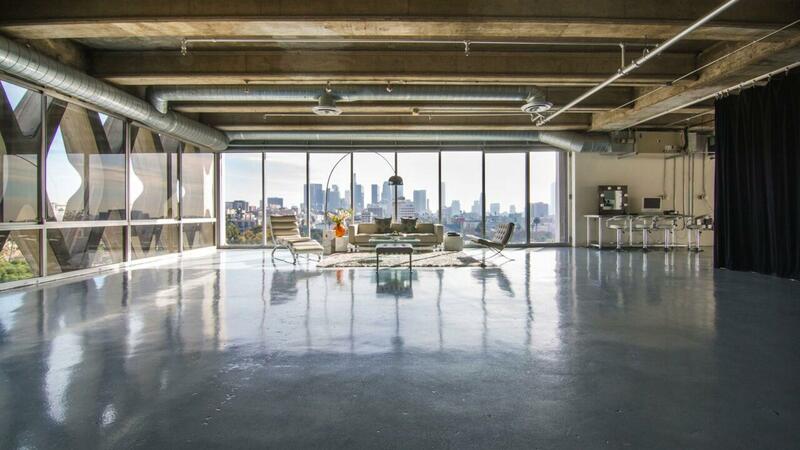 The recently expanded Concrete Loft boasts stunning architecture, a clean modern look, and an unobstructed view of the downtown skyline. Housed on the 7th floor level of the American Cement Building, the Concrete Loft provides photographers and event planners alike a private and crisp, modern location that delivers a considerable amount of ambient light throughout the day. With furniture setups located throughout the property, photo clients can redecorate and create numerous looks within the same location. Event planners have access to multiple private rooms on location, allowing them to store furniture and completely redecorate the location based on their personal vision.